Le Va, in partnership with Pasifika media, has launched the “Pasifika media guidelines for reporting suicide”. This whiteboard video provides an overview. A brother has made a terrible mistake. He has, however, taken responsibility for it and has apologised. Those of us who are offended need to offer forgiveness in the spirit of Pacific compassion, and move on. Gatoa’itele Savea Sano Malifa, founder and editor-in-chief of the incredibly successful Samoa Observer, admitted it was a mistake for the Sunday Samoan edition of his newspaper to have reported on the suicide of a 20-year-old transgender woman, Jeanine Tuivaiki; and especially to publish a photo of the lifeless body of the deceased. 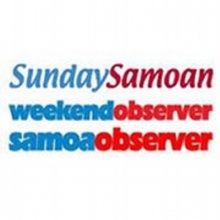 The Samoa Observer has a code of ethics, and Savea is one whom I know to advocate passionately for the need for media organisations to have a code of ethics.There is no excuse for mistakes so blatant as this suicide report, and I would be the last one to offer any justification for what the Samoa Observer did. The Prime Minister of Samoa, Tuilaepa Sailele Malielegaoi has given a very balanced criticism of the Observer. He is a wise friend of media to have done so without resorting to a “ban the media” mentality. Part of the controversial Sunday Samoan front page article on June 19.